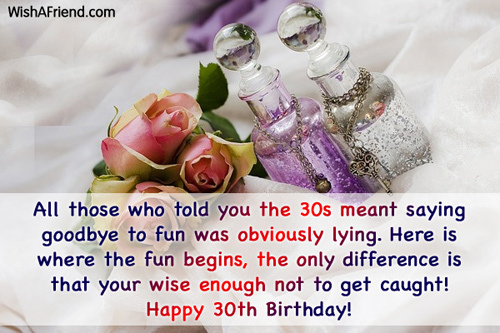 Wish to make someone 30th birthday special? 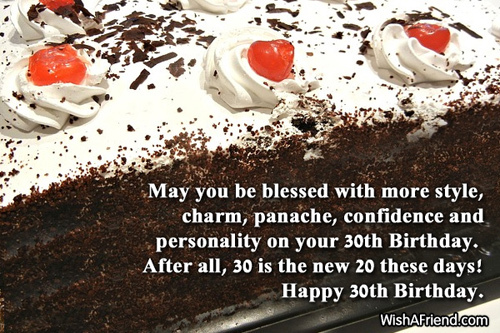 Send these classic 30th birthday wishes and make their day memorable. 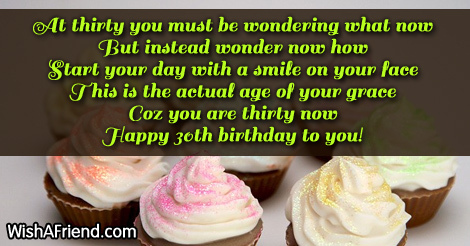 Share these 30th birthday wishes with your friends via Text/SMS,email, Facebook,Whatsapp, IM, etc. 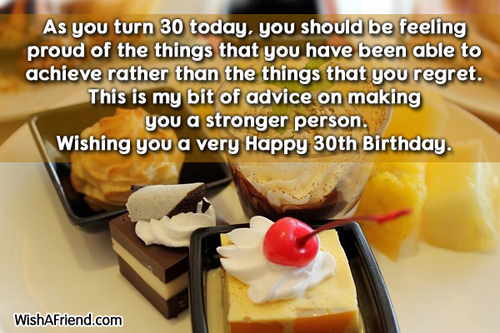 As you turn 30 today, you should be feeling proud of the things that you have been able to achieve rather than the things that you regret. This is my bit of advice on making you a stronger person. 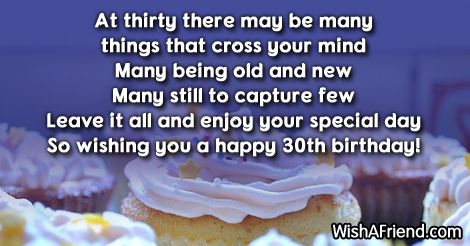 Wishing you a very Happy 30th Birthday. Time to call in for the strippers, time to turn on the music, time to bring in the cakes and delicacies and time to make it a hell of a day. 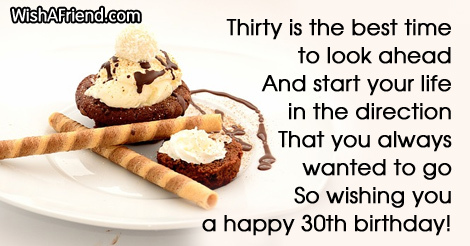 It is your 30, time to make it grand! 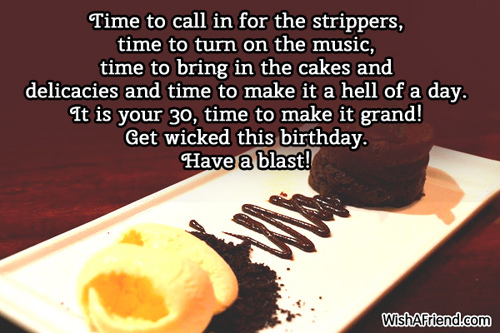 Get wicked this birthday. Have a blast! All those who told you the 30s meant saying goodbye to fun was obviously lying. Here is where the fun begins, the only difference is that your wise enough not to get caught! 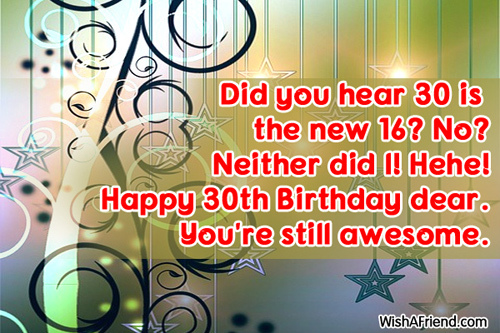 Happy 30th Birthday! 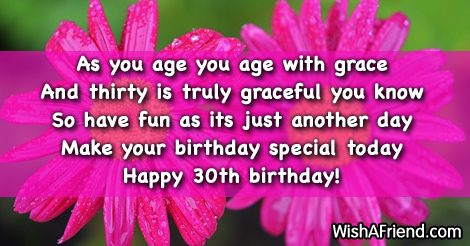 So wishing you a happy 30th birthday! 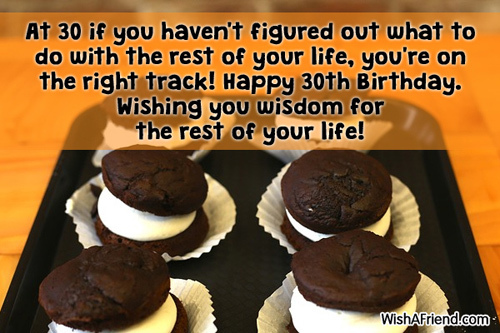 At 30 if you haven't figured out what to do with the rest of your life, you're on the right track! 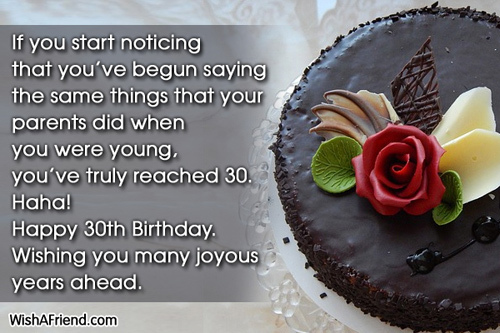 Happy 30th Birthday. 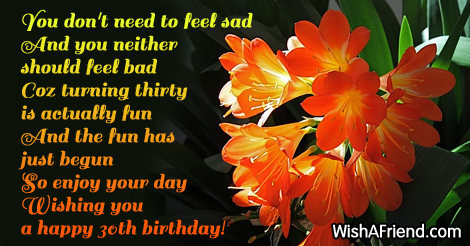 Wishing you wisdom for the rest of your life! Did you hear 30 is the new 16? No? Neither did I! Hehe! 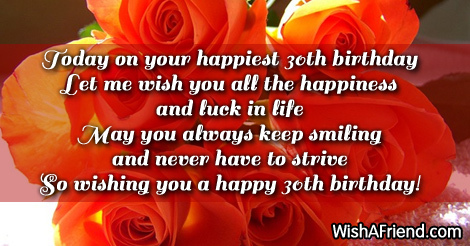 Happy 30th Birthday dear. You're still awesome. When you are 13, you are dying to be 30. 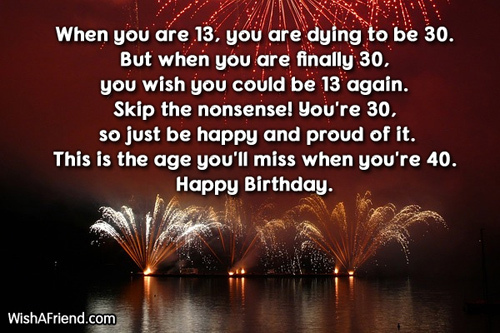 But when you are finally 30, you wish you could be 13 again. Skip the nonsense! 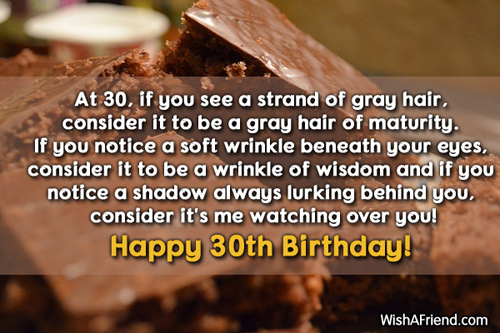 You're 30, so just be happy and proud of it. This is the age you'll miss when you're 40. Happy Birthday. 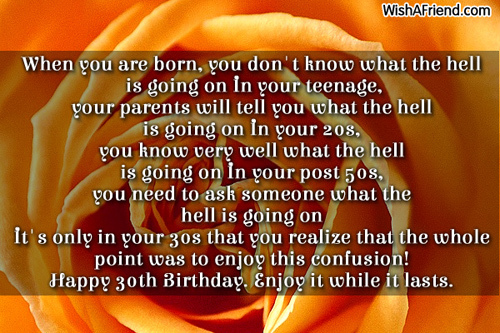 It's only in your 30s that you realize that the whole point was to enjoy this confusion! If you start noticing that you've begun saying the same things that your parents did when you were young, you've truly reached 30. Haha! 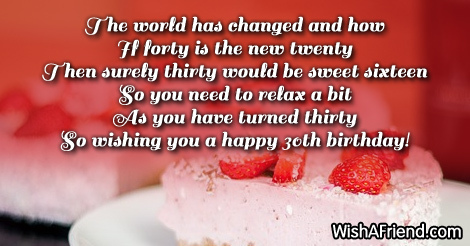 Happy 30th Birthday. Wishing you many joyous years ahead. 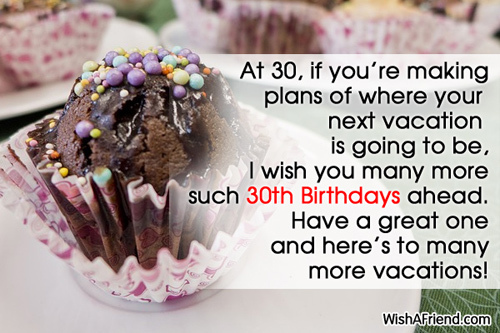 At 30, if you're making plans of where your next vacation is going to be, I wish you many more such 30th Birthdays ahead. Have a great one and here's to many more vacations!